Our Moisture Control range is produced for packaging & protection of moisture-sensitive surface mounted devices (JEDEC std-033). 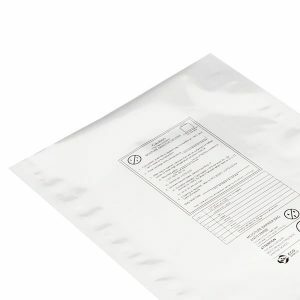 Antistat’s moisture barrier and moisture control bags combine specialized ESD protection and restrict the transmission of water vapor, delivering a moisture-proof packaging solution. Airborne water particles help dissipate static electricity, water is conductive, which allows electricity to travel freely through the air, minimizing ESD build-up. If there’s not enough moisture density in your EPA, electricity will accumulate in pockets, and is discharged when an object of opposite charge is close by. Desiccants are hygroscopic substances for protecting packaging and enclosure contents susceptible to damage from moisture like electronic components. Antistat desiccants are available in a variety of types such as Silica Gel Packets, Activated Clay and Molecular Sieve. Our synthetic and natural materials have absorption performance suited to a range of product types, environments and humidity levels. (HIC) or Humidity Indicator Cards allow a visual check of the humidity levels inside enclosures or packaged items for quick evaluation of desiccant performance. The cards are reversible and alter as conditions change in the packaging environment, allowing users to monitor the conditions of product packaging.